If your order weighs less than 13 ounces, save huge on shipping with USPS first class (with tracking number). This product weighs 16.7 oz. 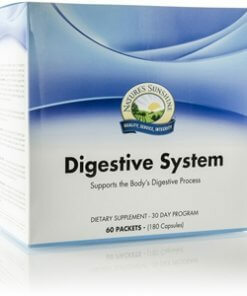 Nature’s Sunshine Digestive System Pack is a 30 day program designed to support the digestive system in the breakdown of nutrients for maximum absorption for use. The nutrients in the products provided in this system may also aid in the elimination of toxins in the body, along with promoting immune system health. 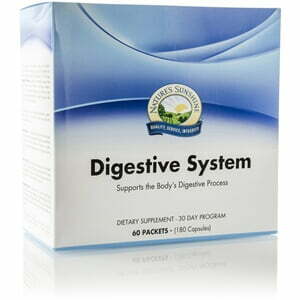 This plant-sourced enzyme product facilitates digestion and improves nutrient absorption. This Chinese formula supports both the digestive and detoxifying functions of the body and supports the natural elimination of excess moisture and toxins. We combined 11 types of friendly bacteria that support proper digestion and nutrient absorption. Probiotics help the intestine and colon by producing enzymes, supporting immune function, and helping to prevent occasional constipation. Instructions: AM packets contain 3 Proactazyme capsules. PM packets contain 1 Anti-Gas TCM capsule and 2 Probiotic Eleven capsules. Take the contents of one AM packet throughout the day, before meals (one capsule before each meal). Take the contents of the PM packet with your evening meal.